This course is scheduled based on demand. If you have 12-15 participants interested in your area and/or on a particular project we will schedule this specialized course. Please contact info@clearabundance.org to find out more or to schedule with us. Thanks! Delivery: Led live in-person by a senior LENSES Faculty Member. 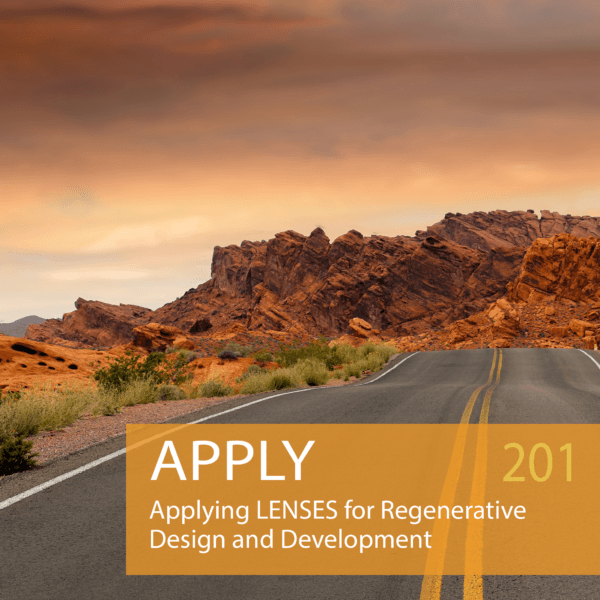 In this course, participants will review the five key concepts of regeneration and the definitions of regeneration, regenerative design, and regenerative development. They will deepen their understanding of the fundamentals of regenerative development how they apply it in the context of a built environment project, organizational development or with personal endeavors. The LENSES principles, process, and application will be discussed and participants will apply key aspects of the Framework to a project of their choice. Particular focus in this course is given to activities utilizing the Flows Lens and Foundation Lenses. Case examples will be utilized to demonstrate examples of successful application and outcomes. ** This course is scheduled based on demand. If you have 12-15 participants interested in your area and/or on a particular project we will schedule this specialized course. Please contact info@clearabundance.org to find out more or to schedule with us. Thanks!